Last weekend was my second visit to Niagara Falls and I thought I will not be as impressed with this natural wonder as I was the first time. However, I was so wrong. It was as though I was watching the mighty falls for the first time. I guess that the feeling of awe will never cease no matter how many times I may get an opportunity to visit the Niagara Falls. Its one of my favourite places on this Earth. We took my dad who is visiting Canada for the first time, to Niagara Falls. We booked him into a falls view room and boy was it spectacular. My niece from Atlanta paid us a surprise visit(my son knew) and she too joined us for the weekend trip. It was her first time too to see the falls. Come evening and we all would gather in my dad’s room to watch the different colours lighting the falls. Its such a pretty sight. Three falls make up the Niagara Falls, the largest being the Horseshoe Falls that borders between USA and Canada, the American Falls which is on the USA side and the small Bridal Veil Falls on the USA side separated from the American Falls by the small island Luna. This time round hubby and I didn’t do the Maiden of the Mist trip but we enjoyed walking through the immaculately maintained gardens, walked along the pathway near the falls, enjoying the shower from the falls as it was very hot. This time we were able to do a mini trail walk further off the horseshoe falls and coming down to the falls. Canada takes preserving its nature very seriously. I wish countries like India and Kenya would learn some valuable lessons from Canada in preserving our heritage and Mother Nature. Both countries have so many beautiful scenic places but are getting lost to development. About 6 million cubic feet of water falls over the crest line every minute in high flow which is 169901079.6 litres !!!!!! So every time hubby and I walked past the falls, we would say ‘if only, if only Mombasa could get that 1 minute of supply we would be fine, no more water shortages. Or can you imagine if Kaveri had about 5 minute supply, it probably would solve water issues between the Karnataka and Tamil Nadu. But that’s all wishful thinking. That’s enough about Niagara Falls. This week for Foodie Monday/ Bloghop group, Priya Iyer blogger at The Girl Next Door suggested #Steamed as our 103rd theme. This theme is pretty challenging if you don’t want to just serve steamed veggies. Many dishes require you to cook the food for a bit on the stove and then steam the end product like papdi no lot (khichu) or like kozhukattai where the flour is first cooked in water and then shaped and steamed. Non vegetarians can prepare steamed fish, chicken etc. Having said that many of the Gujarati snacks are steamed like dokhras, arvi na paan, muthais, Maharastrian vadi, South Indian idlis and kinnathappam. I wanted to make steamed muffins but had to steer away from something sweet. So I decided to make some spinach and cabbage loaded muthias. Most Gujaratis know how to prepare this snack dish. Some make the batter a bit hard, roll the mixture into log shapes and steam. I learnt to make a more softer version from my mother in law Nunu. She would leave the batter a bit more watery so it cannot be shaped. The end result is nice soft muthias. 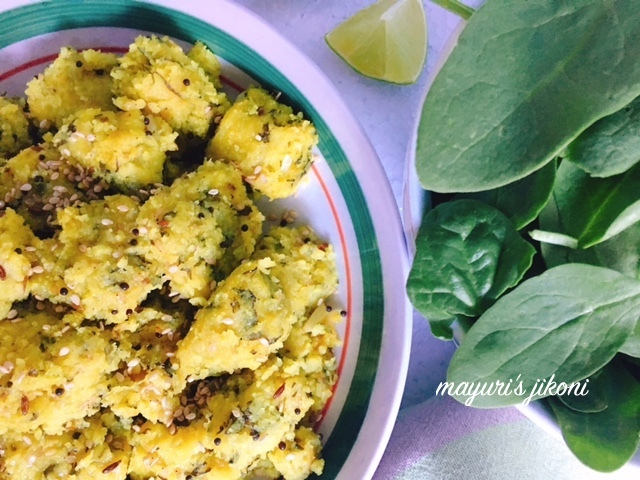 Muthias can be made with besan (chickpea)flour, millet flour, oat flour, barley flour etc. This time round I’ve used handvo flour, wheat flour and semolina. With muthias you can add any vegetables like bottle gourd(doodhi), carrot, spinach, amaranth leaves, methi leaves, cabbage, zucchini etc. Check out my recipe where I’ve used besan, millet, semolina and wheat flour. The veggies I used in that version are doodhi, methi and cooked rice. This time I’ve used cabbage and spinach along with handvo flour. If you want to have it without tempering then have it steaming hot, drizzled with a bit of any vegetable or olive oil. My family enjoys the tempered muthia. Except for the tempering this snack is always steamed. Add flours and semolina to a big bowl. Mix it well. Add oil and rub the oil into the flour mixture. Add all the remaining ingredients except the ones for tempering. Mix the batter very well. The spoon should be able to stand in the batter without falling. Get your steaming device ready. To the steaming pan add water quarter full. The bottom plate should not touch the water. Grease the plates with oil. I used a 3 plate steamer. Divide the batter into the 3 plates. If you are using a bigger steamer then divide the batter accordingly. Put the plates with the stand in the steamer. Close the lid tightly and steam the muthias for 20-25 minutes. Check to see if its done. Insert a toothpick in the steamed muthia and it should come out relatively clean. If batter sticks to the toothpick then add a bit more water to the steamer and steam for further 10 minutes.If the muthias are cooked remove them from the steamer. Carefully remove the plates from the stand. If you want to temper the muthias then it has to be cooled completely before you cut them into squares. Cut the completely cooled muthias into squares. When it is hot add first the fenugreek seeds. Then add the mustard and cumin seeds. Add garlic and saute for a few secs. You don’t want the garlic to burn. Add sesame seeds and immediately add the muthia squares. Stir gently frequently till they are hot. Serve with lemon wedges. Enjoy muthia with a hot cup of masala tea. If the batter becomes too watery, add more semolina or handvo flour. Handvo flour is gluten free as its a mixture of dal and rice. To make gluten free muthia add more handvo flour instead of semolina and millet flour instead of wheat flour. I am a great fan of Muthia. Never tried spinach in it so time to try something new. Muthia looks super tempting and flavourful. Bookmarking it. Will try soon. Love the recipe …bookmarked..will share soon.The Niagara Falls look beautiful with the lighting. These muthias look so wonderful!Will try them soon! Hi Mayuri, I dint know you are in Canada,I wish you were in Calgary,so that we can meet. Niagara falls are far from here. I love muthia, your recipe is interesting, I want to taste now. Loved this recipe, Mayuri! Will try it out soon! Thanks Priya, do try them out and let me know if you liked them. Aruna, try them with spinach.. they taste good. Sometimes I add just spinach. Thanks Sujata, hope you like them when you try them out. Thanks Saswati. The falls are spectacular. The photo doesn't really capture the beauty of the falls with the lighting. Alka do try them, they are filling and healthy at the same time. Thanks Amrita, let me know whether you liked them. Wish I could send you some Sadhna. Thanks Kriti. Niagara Falls is a definite must. Thanks Sujata, hope you like it. The muthia look so flavorful di..would love to try them out soon. Thanks for the share ! Muthias look so tempting. On my to do list . Lovely share. The muthias with spinach sounds tempting. Healthy steamed delicacy. Wow love this, here cabbage and spinach is found in abundant as oppose to dudhi, will try it out. What is the ration of your handvo flour, asking as I know I will get a typical one from you :-), for dhokra flour we use a mix of rice and urad dal. Lovely pictures. Renu, thank you so much. The handvo flour or mixture ratio is 2 parts rice to 1 part dal. I usually take 3/4 chana dal and 1/4 toor dal.